Some hungry travelers come to a village, carrying nothing more than an empty cooking pot. Upon their arrival, the villagers were unwilling to share with the travelers, afraid they would run out of food. Then the travelers went to a stream and filled their pot with water, along with a big stone, and put it over a fire. One of the villagers became curious and asked what they were making. "Stone soup," the travelers said. "But, we are lacking something - maybe a carrot, or turnip. Perhaps an onion." And he went away and came back with some chilies and some salt. Another brought beans, another rice. 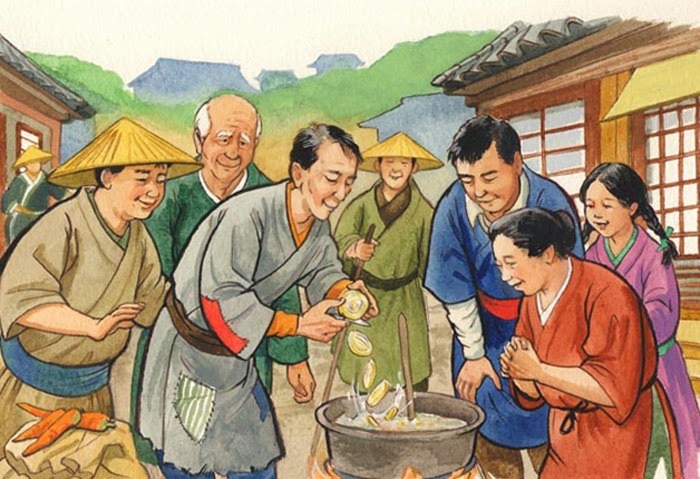 More and more villagers brought various food from their pantries and soon they had a delicious and bountiful soup they all contributed to and all enjoyed eating together. In the early 1990‘s some teachers put in a garden for the children at the Polston School in Alamosa, to teach how to grow vegetables. Everyone loved it so much, the kids from Boyd School on the south side of town came over to experience the garden. The soil in their own school yard was too salty to grow anything. After years of conditioning they would have their own garden. Meanwhile, the Boyd garden brigade hiked to Polston with rakes and hoes slung over their shoulders, whistling, singing, and chattering about what they might find in the dirt that day. The teachers found the garden a useful tool for explaining mathematics, science, geography, history, language arts. Every subject could find its way into the garden as the children were introduced to the world of building soil, along with the character building and empowerment that comes from growing your own food. But, as the State ramped up testing mandates and clamped down on curriculum regulation, there was less and less time for such hands-on learning in the school day. A group of volunteers from the community stepped in to run both Polston and Boyd school gardens similar to the old Victory Gardens during World War II, with an emphasis on teaching. The schools continued to employ as much garden education as they could fit it in their schedule. This group of garden enthusiasts built a solar greenhouse at another site in town, the only one of its kind in the country at the time - capable of producing vegetables throughout most winters, unless they are furiously frigid. The Polston garden was put in between the play yard and the river, in the leeward shelter of a line of cottonwoods. Anyone could come to “garden night”, Tuesdays in the late afternon/early evening as the sun sank low in the sky, shining across the river, through the trees and grasses, giving the light itself a verdant radiance. I loved sinking my hands into the earth of that garden so rich and full of ancient alluvial matter, made from aeons of the river’s moods and movement. It was easy to forget we were in the desert during garden night at Polston. Many changes happened with regard to the school gardens over the years. Somewhere along the way, for instance, the yields improved so much that the garden began supplying the food bank and La Puente homeless shelter. They in turn provided the gardens with volunteers who had come to the San Luis Valley to help solve the problems of hunger, homelessness, and poverty. Some considered the gardens the most important work they did in this regard. Despite all the changes, there is one fiercely protected tradition begun in the garden at Polston so many years ago - that of Stone Soup Day. Using the old folk tale as the basis, children learn about using cooperation to turn scarcity and fearfulness into bounty. Held just after school resumes in the fall, the Stone Soup event familiarizes students with what the garden has grown over the summer and is ready to be harvested. Along with cooperation and imagination, the garden provides the rest of the ingredients of the remarkable soup that feeds the entire school. The event is a collaboration among teachers, students, parents, and volunteers from the community. As such, it is a metaphor for the gardens - teaching people to work together to turn scarcity into bounty.